I've just been reviewing a band for the next edition of Leftlion. This isn't usually that arduous a task as I only have 150 words to play with, but I really needed to get the review done tonight as my deadline is Saturday and I'm away for most of the weekend. The mag generally covers small, local bands, so we're supposed to be as positive as we can. If we're given something we really don't like, we just don't write a review. I can honestly say that this has bever been a problem for me as I've mostly liked the stuff that I've been sent to review. The music editor mostly sends me stuff from the punky/rocky end of the musical spectrum, and some stuff is markedly better than other stuff, for sure, but it's all pretty good and I like the discipline of listening to music without preconceptions and trying to form my own opinion. Tonight I was reviewing "One Hand Washes the Other" by Band of Jackals. You know what? For the first time in the time that I've been doing this, I've been sent something that I can actually say is really, properly good. They've got a real desert blues-rock vibe going on, but the songs are good and the production values seem to be unusually high too. Ah hell: here's an exclusive preview of my 150 words. Joshua Homme hails from the deserts of California and you can definitely hear that influence in the skuzzy, dirty rock of his band, Queens of the Stone Age. 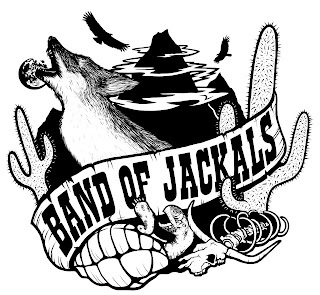 Nottingham is an entirely different kind of badland, but you can still hear the tumbleweeds blowing across the arid soundscapes of Band of Jackals’ latest EP. There’s a real and justified swagger in the way that these guys rip out these perfectly formed blues-rock stompers. QotSA are probably the obvious reference point, but there are echoes too of the Black Keys, the Raconteurs and maybe even Led Zeppelin themselves. These guys have got some proper musical chops: “Tempted by Lasers” and “Two Revolutions” are every bit as good as any rock song I’ve heard this year. In fact, these guys are so good that it can surely only be a matter of time before Dave Grohl is banging down their door for a guest appearance. Hopefully that will appear in the next mag in a few weeks. Do yourself a favour and check out some of their music though. Maybe they sound a bit *too* much like QotSA, but they are really, really good. Their Facebook page is here and their Soundcloud page is here and you can get some of their music from there. I'm not kidding either: “Tempted by Lasers” and “Two Revolutions” in particular are as good as anything else rock that I've heard this year. You can listen to both on their soundcloud, so go and make up your own minds. Good local music. Get it whilst it's hot.